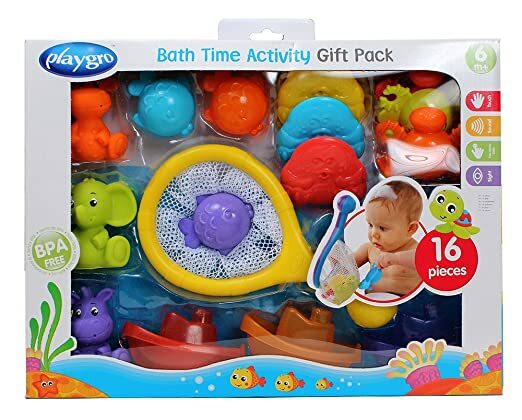 Playgro’s Bath Time Activity Gift Pack will entertain and delight baby 16 pieces that bring splish, splash fun! Three brightly colored floating creatures scoop up the water, with an array of different holes for water to pour through. The floating creatures can also be linked together to form a chain or scooped up in the bath net. Different soft, squeeze bath squirters can fill with water for fun water play. This pack is the ideal gift for babies beginning to enjoy bath time offering vibrant colors, varied textures and delightful sounds. For ages 6 months +. MSRP: $34.95. Cassandra's review- Each toy is very well made and safe for your little one over six months old. I also have children a little older that like to share them during the separate bathtimes as well. The toys are easy to clean but I did have to air dry the net outside so it would not mold. I like that they do not contain BPA so if my little one does decide to gum them, it is so much safer. The set can be used as a dry toy too for around the house or on the go. Plus if you do not have a bathtub they can be enjoyed in a pool. If kept in good condition this can be a fun option all year long.